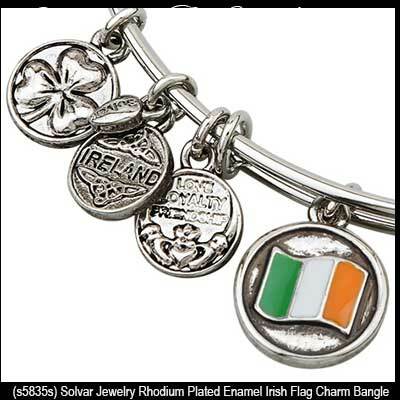 This charm bracelet features the Irish flag on an expandable wire bangle. Sorry this charm bracelet is now sold out and we do not know if or when it may be available again. This tricolor flag bracelet, like all the Irish made jewelry at The Irish Gift House, is nickel free and hypoallergenic. 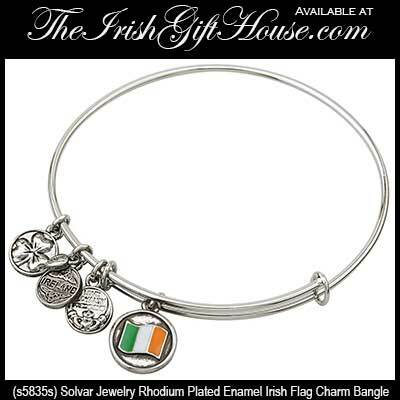 This rhodium plated Irish bracelet is a expandable wire bangle that features a 5/8" wide Irish flag charm that is enhanced with tricolor enamel. Additional included charms are the 3/8" wide shamrock and Claddagh along with a Celtic knot enhanced Ireland charm. The bracelet is designed to fit most women's wrists and is crafted by Solvar Jewelry in Dublin, Ireland.